What is Twitter Changing Now? It’s no secret that Facebook is no longer the best “free” social media platform to get your reach out there. No, Facebook doesn’t necessarily cost money to use, but it does cost money if you are trying to reach all of your followers. Can you believe that with the information and pages upon pages of businesses on Facebook, you, as an individual, are probably exposed to only a small fraction of what you’re trying to follow. Can you imagine how the business feels? They’re out there shouting in the woods with no one around to hear them. And, that’s a waste of time. Which is a waste of money. So, it’s also no secret that businesses are looking elsewhere for that “free” reach. Twitter is a good example, especially because Twitter has a much easier search and discovery function. People can get your business suggested to them as someone to follow. They can search keywords and come up with Tweets or People as results. Well, folks, Twitter is also making a few changes along the way. They are also trying to be a profitable business. It’s one thing to hold a ton of value, but if you’re not financially banking off of it, then you’re also wasting a lot of your time. It’s going to look more like a Facebook profile page. Your header image (similar to your cover photo) will be wider and more prominent and stretch across the entire width of your page. There is no more background image (that I worked so hard on designing when I set up my Twitter account.) The profile image is now slightly larger. Thankfully. Who could even see Twitter profile images? Ever. Tweets that gain popularity will actually be physically larger. That means if a tweet has many Retweets and Replies, you’re going to see it show up larger in stature on your page. Twitter is so fast-moving. Your Tweet today is gone tomor…no, it’s gone in 30 seconds. So, if you have something important you want to Tweet, you can now “pin” it to the top of your page. This is great for promoting contests, etc. You can now search your Tweets and other Tweets by Tweet, Tweets with Photos / Videos and Tweets with Replies. You can now tag up to 10 handles on your Twitter photos. This a) encourages the use of photos and b) does not take from your 140 characters. You can utilize this to your advantage if you are a business and want to reach out to other businesses or clients / customers. Or maybe you want to reach out to celebrities. You can also start Tweeting up to four photos per single Tweet. Awesome! 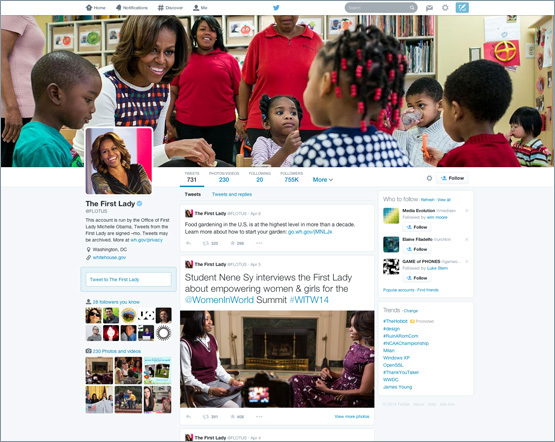 What do you think of Twitter’s changes? Are they moving in on Facebook’s turf? I mean, if it works for Facebook and businesses are starting to move away from Facebook, will it help Twitter? It’s only a matter of time that Tweets that aren’t sponsored will not show up in Twitter Feeds. So, hop on the bandwagon now before it’s too late.